Documents created by Microsoft Word can unfortunately contain hidden or unwanted data embedded within the file and for those with the know-how, access data which you would otherwise not approve of sharing. With Doc Scrubber, you can effectively 'scrub' or clear these documents of embedded data while maintaining the integrity of the original document. Some of the data included in Word files may be comments, links, recent saved data, last printed time and other metadata which is either unhelpful to the recipient or may open your office up to attacks. In a default setting, Doc Scrubber will not overwrite the data of the original file, but rather provides you with an alternative document copy (whose filename includes a suffix) so that you may safely share it outside of the home or office. Version 1.2 is a freeware program which does not have restrictions and it's free so it doesn't cost anything. 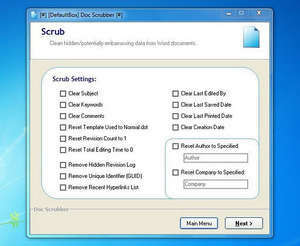 For security reasons, you should also check out the Doc Scrubber download at LO4D.com which includes virus and malware tests. Additional screenshots of this application download may be available, too.